Cargills Food City, has launched its first Fruit and Vegetable wholesale price display terminal at its fresh produce collection centre in Thanamalwila. 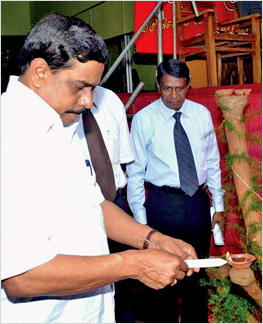 The terminal was ceremonially declared open by Minister of Coconut Development Jagath Pushpakumara last month. Chief Operating Officer-Retail, Sidath Kodikara Cargills (Ceylon) PLC said that the launch of the wholesale price terminal further reiterates the commitment of Cargills towards the empowerment of smallholder farmers. "Cargills continues to offer prices above the wholesale market to farmers along with technical inputs, training, and market information while facilitating credit. Through our retail chain and our Group's manufacturing facilities we have created a revolutionary shift in taking thew market to the farmer. Today with this launch of the price terminal we have taken this a step further by providing market intelligence to the farmers." He added that the price terminals would be launched at all collection centres under the Group including Jaffna, Nuwaraeliya and Bandarawela. Cargills had during the year concluded, collected over 3,800 metric tonnes of fruit and vegetable from thew Gangeyaya community in Thanamalwila, to the value of Rs 238 million. 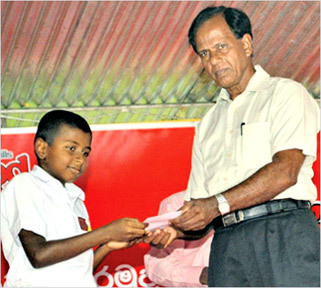 The ceremonial launch of the Cargills wholesale price terminal was held alongside the distribution of Rs 1.9 million worth of benefits to the farmer community as part of the Cargills Farmer Community Development Fund established in Gangeyaya, Thanamalwila.Over 40 scholarships wee awarded to students who have passed Grade 5 Scholarship exams and those pursuing Advanced Level and External Degrees. A further 5 laptops were awarded to students from the area pursuing University education. Fifty four students who are from families facing economic challenges were also granted learning material while a further 15 farmers who have made the highest contribution towards fresh produce collection from the area were given farmer equipment. In addition a resting hut and 100 chairs was donated to the Farmer Society while plastic crates for post-harvest transportation was distributed among 30 farmers. 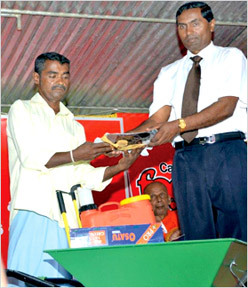 Cargills Food City also provided HNB Assurance Farmer Insurance schemes for 137 farmers free of charge. The scheme entitles farmers to death, accidental death, disability and permanent disability covers as well as hospitalization benefits. This disbursement of benefits comes as part of the annual community development initiative planned by Cargills together with the farmer community and World Vision Lanka. 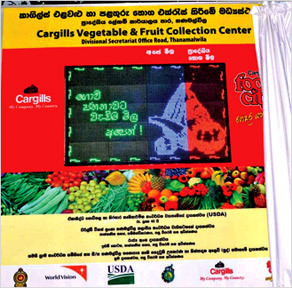 Explaining the project, Deputy General Manager Haridas Fernando Agribusiness for Cargills said, "every time Cargills buys a kilogram of vegetables form the farming community in Gangeyaya 50 cents goes back to a community development fund. Annually the funds are utilized for scholarship and projects that would develop the quality of life of this community." General Manager, Keerthi Gunasekara, Retail Operations of Cargills added "We have developed a similar fund at our collection centres in Jaffna and Moneragala with plans to expand the concept to all farmer communities we work with. The funds provide scholarships for needy children from the community, resources for learning and advancement and even meet basic community infrastructure needs such as utility connections, community centres, libraries etc. Our focus is to engage the communities that work with. The funds provide scholarship for needy children from the community, resources for learning and advancement and even meet basic community infrastructure needs such as utility connections, community centres, libraries etc. Our focus is to engage the communities that work with us to charter their own course of development."